If water has accumulated to a certain depth on the road surface, there is a danger of hydroplaning occurring, even if: • you drive at low speeds. • the tires have adequate tread depth. 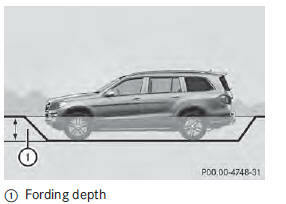 Check the depth of any water before driving through it. Drive slowly through standing water. Otherwise, water may enter the vehicle interior or the engine compartment. This can damage the electronic components in the engine or the automatic transmission. Water can also be drawn in by the engine's air suction nozzles and this can cause engine damage. set the raised level before driving through standing water. Under no circumstances should you accelerate before entering the water. The bow wave could cause water to enter and damage the engine and other assemblies. 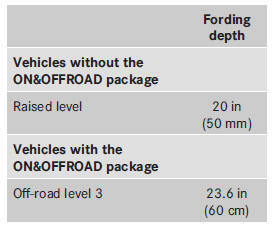 Do not open any of the vehicle's doors while fording. Otherwise, water could get into the vehicle interior and damage the vehicle's electronics and interior equipment. • Establish how deep the water is and the characteristics of the body of water before fording. 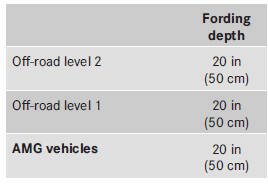 select the highest possible vehicle level. • Restrict the shift range to 1 or 2. • Enter and exit the water at a flat place and at a steady walking pace. • Drive slowly and at an even speed through the water. • Water offers a high degree of resistance, and the ground is slippery and in some cases unstable. Therefore, it is difficult and dangerous to pull away in the water. • Ensure that a bow wave does not form as you drive. • Clean any mud from the tire tread after fording. • Apply the brakes to dry them after fording.